Treat her to unmistakable elegance. 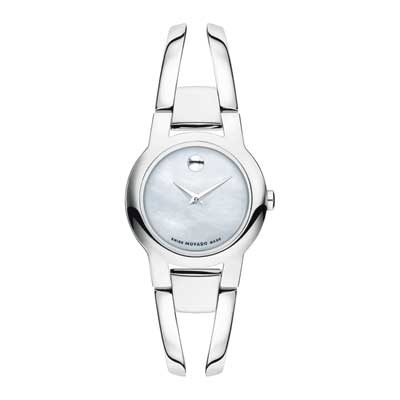 This ladies' Movado Amorosa watch features a round mother-of-pearl dial with silver-tone hands and a signature Movado dot at the 12 o'clock hour in a stainless steel case. The reliable Swiss quartz movement ensures accurate time keeping. This watch is water-resistant up to 30 meters and the polished stainless steel bangle secures with a fold-over clasp. This watch includes a two-year limited warranty. PRODUCT SPECIFICATIONS Watch Model Number	0606538 Watch Brand	Movado Movement	Quartz Stone Type	No Stone Height x Width	24.0 mm Metal Color	White Metal Type	Stainless Steel Typographic errors are subject to correction. Merchandise enlarged to show detail and may not always be exactly as pictured. Promotions, prices, styles and availability may vary by store and online.